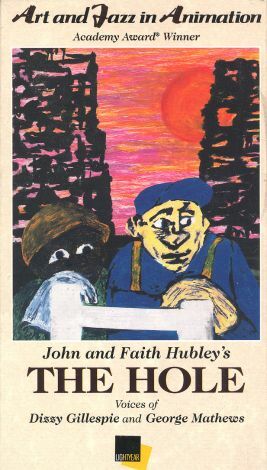 Produced by the innovative animation team of Faith and John Hubley, The Hole spotlights a pair of construction workers, one white, one black. Working deep underground, our cartoon heroes begin discussing the possibility of nuclear annihilation. Suddenly, an errant rat accidentally triggers an air-raid alarm. At the same time, a crane drops a load of debris with a thundering crash. Fearing that "the bomb" has indeed dropped, the black worker climbs to the surface, peeks outside, and...well, this is a very short bit of animation, so we won't give everything away. Suffice to say that The Hole, while brilliantly conceived and executed, may be a bit too serious for the Bugs Bunny and Wile E. Coyote crowd.